Nineteen years is a short life, but that’s all that Kyle Hancock of Glen Burnie, Maryland will get. Hancock died, buried alive earlier this week in a 15-foot unshored trench. Rescuers worked almost 12 hours through a long, rainy night trying to recover his body. The trench that killed Hancock was between 15 and 20 feet deep according to news reports, and had not been properly shored to prevent its collapse. OSHA has a good trenching and excavation standard that requires all trenches over 5 feet deep to be shored. The OSHA website also has good information on trench safety, and OSHA’s onsite Consultation Program provides free onsite health and safety help to small and medium size employers. Some jurisdictions have aggressively pursued criminal prosecutions, but they keep happening. Kyle Hancock isn’t the first worker to die in a trench in Maryland recently. 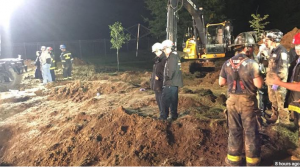 A construction worker died when a trench collapsed at a Prince George’s County work site in July 2017 and another was killed in Severn, Maryland a 7-foot deep trench last August. A very lucky worker was rescued from a 16 foot deep trench in Cumberland, MD in 2016. Most workers trapped in trench collapse don’t make it out alive. A cubic meter of dirt weighs around 3,000 pounds, as much as an automobile. Not only can it take hours to dig someone out without rescuers becoming trapped, but the weight of the soil can kill a person even if their head isn’t covered. For example, in 2014, Robert Matthew Craig, 26, of Myersville, MD, was rescued after being buried from his waist down in about 10 feet of rock and dirt, but later died. Many workers rescued alive from trench collapses later die of crush syndrome, a medical condition that results in a major shock to the organs and kidney failure. Between 2011 and 2015, according to the Bureau of Labor Statistics, 94 American workers were killed in trench collapses. In 2016, 23 U.S. workers died in trench collapses and 15 died in the first five months of 2017. I write a lot about trench collapses (Most recently here, here, here and here.) They make me mad, because they’re so preventable. I don’t want to write about them any more. Correction: Later news reports revealed that Kyle Hancock was actually 20 years old. As a compliance officer in the D.C. Area Office in the first years of the Reagan Administration I was well aware of the trench fatalities in Northern Virginia. Here was the plan to end those tragedies: Post Office, and policemen were trained to recognize dangerous trenches and make the correct calls. Compliance officers living within the beltway were given government cars and were essentially “on call” responding to notices from the A.D. or the Safety Supervisor. This was a 24/7 approach and I do believe it had success. Upon surrendering the State of Virginia to the state plan folks and moving the D.C. compliance efforts to Baltimore that program was stopped. Virginia ran its program out of the Tidewater Area and I believe statistics would show a serious up tick in trench fatalities throughout Northern Virginia began almost simultaneously. That is how I remember it. I very much enjoy your reporting on the work you do and the work that was my career.